Here’s a great way to look at any golf club when you are either analyzing your own game or buying new clubs. Always think of the shaft and the head as two separate independent entities when hitting a golf ball. Each has a job to do. The shafts job is to bring the clubhead into impact the same way every single time with your given swing. The head’s job is to impact the golf ball and send it on its way with the desired trajectory, direction and best distance. At impact, the clubhead can actually be considered a free wheeling object. It reacts on its own mass and dimensional qualities. For example, on an off center toe hit the clubhead rotates slightly open and about its own center of gravity. It does not rotate around the shaft. The clubheads mass moving at a certain swing speed imparts the energy at impact to move the ball forward. This is what makes the design parameters of the head such as center of gravity location, weight and moment of inertia so important regarding playability. The golf shaft is bending and twisting during the swing because it is basically a flexible hollow rod. As the golfer swings the club there is a point where the wrists release coming into impact. When this occurs the clubhead is traveling faster than any point along the shaft. This causes the shaft to bend in a forward direction with the clubhead ahead of the shaft as it approaches impact. This forward bending causes the clubhead loft at impact to be increased and the clubhead face angle at impact to be closed slightly. Also, because the clubhead’s center of gravity is not located in line with the axis of the shaft, centrifugal force acting on the shaft causes it to also bend downward thus flattening the lie angle. Oddly enough all this shaft bending action in multiple directions actually causes the clubs length to be shortened. This is why a club that played just ok can play so much better if the proper golf shaft is fitted to the golfer. Finding the correct combination of clubhead and shaft is very rewarding. 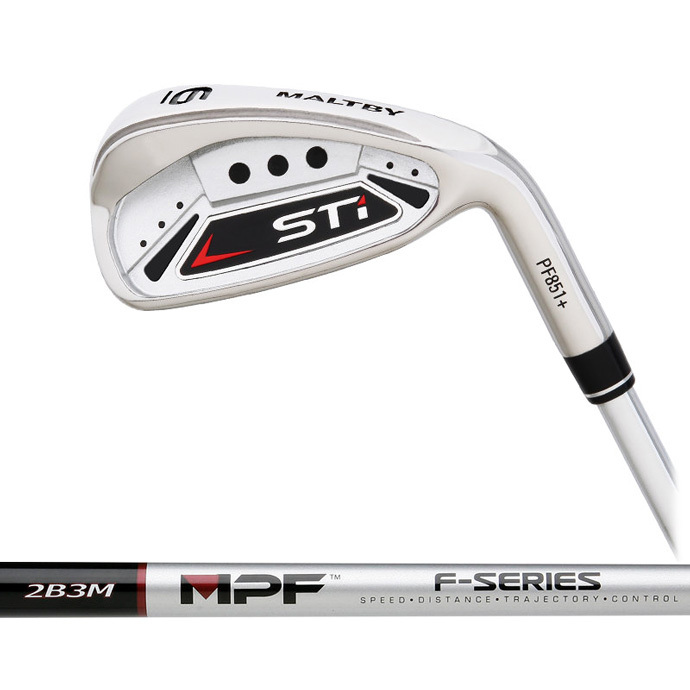 Take a look in the shaft section of The GolfWorks catalog and you will be able to find a number of choices in shafts that fit your swing by using the MPF Shaft Playability Ratings. Hundreds of shafts are listed, so simply use the 5 simple steps in the catalog to guide you. Any manufacturer’s clubheads can be selected by playability using the Maltby Playability Factor for Irons guide which is listed on this website. The Maltby Playability Factor for Irons Book is also available for the enthusiast who really wants to get into all the playability differences of many of the most popular irons and learn why these differences exist. Feel free to view the 2015 MPF Head Ratings Chart for hundreds of MPF ratings. So, always think of the shaft and the clubhead as two separate entities in hitting a golf ball. If you look at it this way it will make it much easier to learn how to fit shafts, find the best shaft for you and also select the proper clubhead for your game.